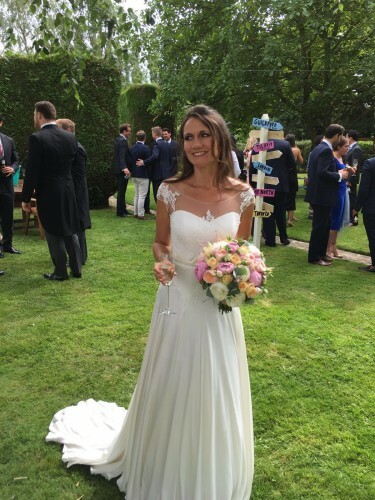 A little note to say a HUGE thank you for making me feel truly wonderful on my wedding day. From the moment I stepped into BOA with my Mum, we knew it was a special place and ended up buying the 2nd dress I had ever tried on! Philippa and Maureen were amazing, making me feel comfortable and confident from the start, even Sheila and Katie who hadn’t seen me before were so helpful. My wedding was on 30th July this year and attached is a picture of me wearing my ‘Loretta’ dress with the ‘Leigh’ bolero which Maureen customised for me so it had a V back. In the evening I took the bolero off and attached a beautiful Ivory & Co sash for a more ‘glitzy’ look! So, a heartfelt thanks to everyone, you made me feel a million dollars and I’m still on cloud 9…!